Being the leaders in the industry, we offer Dairy Machines and Ghee Clarifier to our highly valued clients. - Capacity 1200 Liter/Hour Hermetic Type. The Clarifier is Online Solid Bowl; All Milk Contacting Parts are of AISI-304 with 1 H.P. Three Phase Electric Motor. Specifications : 1000 LPH (Hydraulic) Capacity1HP/0.75kW/50Hz/1440/440Volts/Three phase motor along with standard tools & accessories. We offers best quality Ghee Clarifier, Ghee Purifier for Dairy Industry. Quality of our dairy equipments are of international standards, hence we are leader in exporting dairy equipments. 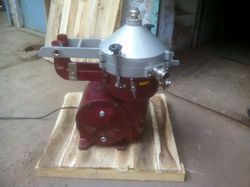 Solid-retaining centrifuge used for ghee clarification. - Ghee is a frying and cooking medium with a distinguished flavor. - It is sometimes preferred for deep frying over oils because of its relatively higher smoke point (482° F). - Ghee consists of pure clarified milk fat derived solely from milk, desi (cooking) butter or cream to which no colouring matter is added. With sincerity and hard work of our professionals, we have carved a niche for ourselves in this domain by providing a premium quality gamut of Ghee Clarifier Machine.